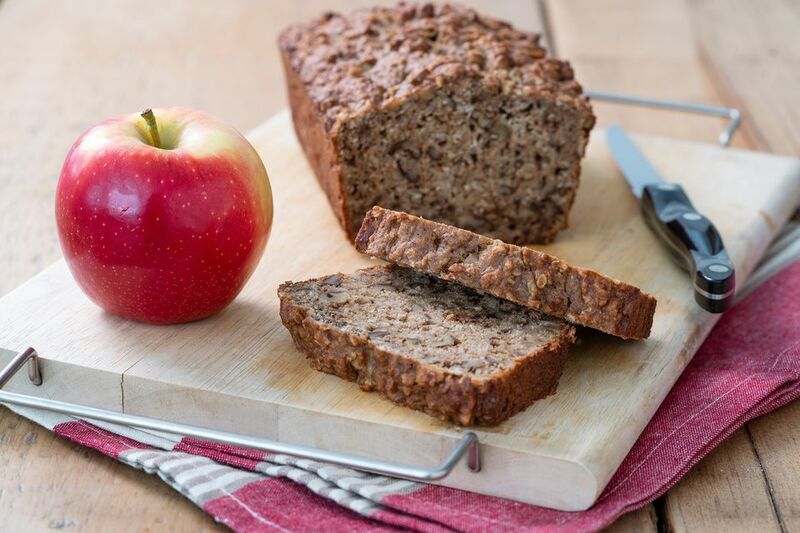 If you are looking for a quick bread that isn’t too sweet, this applesauce bread is for you! The recipe uses whole wheat flour for a more robust flavor and texture. Then, some of the sugar and fat typically found in quick bread recipes is substituted with smooth, thick applesauce. You can use store bought applesauce or make your own, both taste great in this recipe. Cinnamon and nutmeg are added to the batter for a hint of fall spice. Next, the batter is given added bulk with the addition of rolled oats. Finally, chopped walnuts bring additional flavor and crunch to every slice. Preheat oven to 350 degrees F. Lightly grease and flour a 9 x 5-inch loaf pan or coat with cooking spray. In a large bowl, combine the flour, cinnamon, baking powder, baking soda, salt, and nutmeg; set aside. Cream butter and sugar with an electric beater in a large mixing bowl. Thoroughly beat in applesauce and eggs. Add wet ingredients to dry ingredients and blend well. Bake until bread is golden brown and tests done when a toothpick inserted in the center comes out clean, 55 to 65 minutes. Allow to cool in pan about 15 minutes. Remove from pan, and let cool completely on a wire rack. Toasting Nuts: For more flavor, try toasting the walnuts before adding them to the batter. Toasting brings out the natural, rich flavor in walnuts while mellowing out some of the bitterness. Simply heat in a dry pan over medium-high heat until fragrant, or warm on a sheet pan in a 375 F oven for 5 to 7 minutes until the aroma fills your kitchen. Watch them closely so that they do not burn. Freeze It: This recipe also freezes well. Once the loaf is completely cooled, wrap in plastic wrap and then a layer of aluminum foil. Be sure to label the outside so you don’t forget what's in there. Once defrosted, toast up individual slices of this applesauce bread and serve with a hearty spread of peanut butter. Great Gift: Since this hearty bread stores and transports well, it also makes for a great edible gift. Wrap individual loaves in decorative plastic wrap and then secure with a bow. Don’t forget to print out a copy of the recipe to include with the card. Friends and family will love receiving something homemade that is sweet without being overly indulgent.